Sergey Furkalo is a specialist doctor in Retrograde LAD CTO recanalisation in patient with critical LM stenosis. He studies modern standards of medical care and improving of interventional technique in clinical practice. He pays special attention to complex invasive interventions on coronary arteries, main stem of the left coronary artery, bifurcation lesions, results of the use of biodegradable technologies and intravascular imaging. 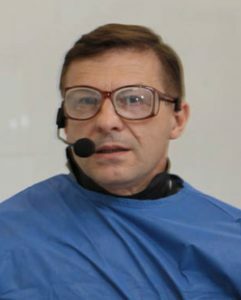 Sergey Furkalo knows a lot about interventional treatment of chronic coronary occlusions (CTO) and endovascular treatment of pathology of thoracic and abdominal regions of aorta and innovative technologies in the treatment of critical lower limb ischemia. S Furkalo also concerns about treatment issues of renovascular hypertension and use of anti-embolic cava filters. Dr. Furkalo also cares about issues in interventional radiology. He is the honored guest of many cath labs of leading clinics.